Dane works in facility maintenance. His group manages 1600 buildings across multiple educational facilities. Budgets are tighter now, and there is not enough money to fix every facility problem that comes up. Don’t measure to prove; measure to improve. There is nothing intrinsically wrong with Dane’s list of potential measures. But the trouble with measuring to prove that you need more money is the assumption that more money should be available when there are more problems to fix than the current resources are coping with. Not enough resources is not a reason for performance to fall short. 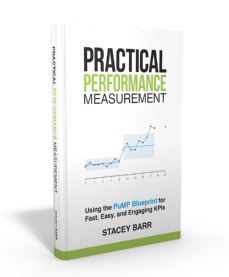 What’s needed is measuring to fundamentally improve performance. That means forgetting for a moment that budgets are the constraint that needs to be lifted, and instead look with in the business process for constraints on how much can be achieved (despite the budgets). Create customer-centric results and measures. Dane’s team need to tailor the customer-centric priorities a bit, to frame them in their facility maintenance context. This means that they will write their own versions of these priorities, in results language. And this will give them a focus for what to measure to get the best performance. The list of customer-centric results and measures will depend on where Dane’s facility maintenance processes have the most potential to improve. There is no off-the-shelf set of measures that fits every situation. Let’s take a look at a couple of examples for Dane’s team. Dane’s first result might be: Facility maintenance and repair jobs that affect safety or the environment are fixed the soonest. As well as being the highest priorities to customers, not fixing the safety or environment related problems can be costly. So they need the most attention of all the maintenance and repair jobs. A second result for Dane might be: The risk of unresolved facility maintenance and repair jobs in the backlog is low. The building owners’ priority might be that all jobs are addressed within budget, but that’s not going to happen immediately, if it can at all. Dane’s team needs to focus on hitting the high risk jobs first, and then creating more capacity to knock off the backlog of lower priority jobs. Find out what’s constraining the sub-processes. Often scheduling problems are solved by minimising the time between jobs. In a maintenance and repair context, this might mean that as many jobs that can be fixed in one location are fixed in one visit. But this can mean the priority jobs, like the safety-related ones which might be spread over many locations, are left waiting. If that’s the case, a redesign to the scheduling of maintenance and repair jobs would be needed, if Dane’s team were to get the best performance in their customers’ eyes. They might, for example, reorganise some of their maintenance technicians into a triage team that has what they need to fix safety or environment problems on the spot, but schedule lower priority jobs for later. And when they feel they’re on top of their priority results and the measures are showing improvement, they can turn some attention to process analysis, to find out more constraints on getting the lower priority maintenance and repair jobs done, with less time and effort. Don’t assume that tighter budgets must always constrain performance. Look inside your processes for hidden constraints first. 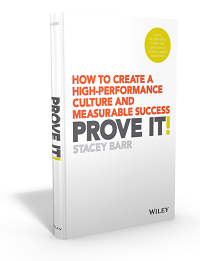 Do you know who defines ‘performance’ of the things you produce? Do you know how they define it? 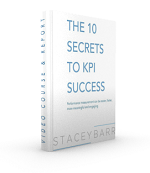 Find out, and create performance measures to monitor and improve those things first.